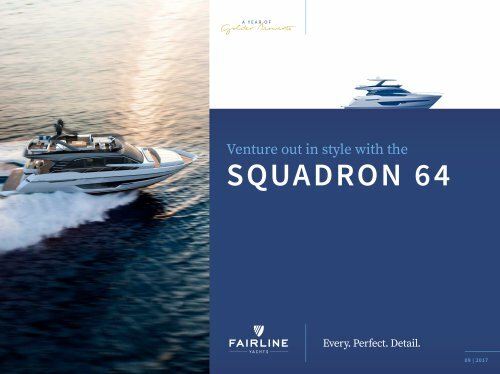 Forward Sunbed Forward Seating CE L E BRATI N G 50 YE A RS Flybridge Extravagantly spacious with enough room to house three distinct social areas. Available in three optional configurations. Main Deck Beautifully set on a single level, the saloon flows elegantly around an open and aft-facing galley. Lightness and extraordinary detail work magically together to transform this remarkable space. Lower Deck – 3 Cabin The vast master cabin, boasts it’s own seating area, double bed and a cleverly concealed en suite bathroom. Other sleeping arrangements include a spacious en suite forward cabin with a double bed and an en suite guest cabin with two single beds. A day head fits comfortably in-between. Lower Deck – 4 Cabin With the 4-cabin configuration, enjoy extra space for more guests by replacing the day head with an additional 2-bunk bed cabin. (Both 3 and 4-cabin configurations include the option of adding a twin-bed aft crew cabin with its own en suite facilities).